The next set of recipes on deck are classics; Chocolate Chunk and Chip Cookies, and a variation, Double Chocolate Chunk and Chip Cookies. The only difference was the addition of cocoa powder to make the double chocolate. Nothing wrong with more chocolate! These were a great follow up to the Oatmeal Raisin and TLC cookies from last week. The technique is similar, so it wasn't a difficult recipe to follow. 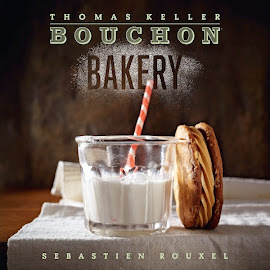 The cookies were thin and crispy with a chewy center, and very large, which seems to be a Thomas Keller signature. According to the recipe, the reason for using both chocolate chunks and chocolate chips, is that the chunks will melt but the chips don't. Everyone enjoyed this week's assignment, and these are definitely cookies that we'll all revisit again. I made the chocolate chunk and chip cookies. The procedure for these was similar to the TLC's. I followed the same technique as I did last time, with standard measurements, used a 2 inch scoop, and I used one whole large egg, which I did not strain. I chilled the dough for 30 minutes, then again for 20 minutes between batches. I baked the cookies at 325 degrees for 19 minutes, rotating sheets halfway through. I made 12 quite large cookies! They turned out great! Thin and crispy on the outside, but chewy on the inside. The addition of molasses was interesting, and I'm sure it helped keep the cookies chewy and moist. I used Ghirardelli bittersweet chocolate chunks, and Tollhouse chips. I think using better quality butter and chocolate would really elevate these cookies, but I just used what I had on hand. Next time I will use the best ingredients, and add a little vanilla and a pinch of cinnamon. Overall, a great recipe, and one I will continue to use. Went for try #1 for Chocolate Chip cookie. I did not find any chunk chocolate the day I was shopping so went with all 70% chips. I used 200gm in all. Basically one bag. The molasses is an interesting technique. Here is my issue, I have just pulled them from the oven and have not tasted yet. Torture! So, the tasting review will have to wait. 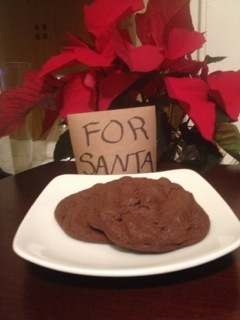 Here's my recap...of the chocolate chunk and chip cookie.This recipe made 14, 2" size cookies. I used Guittard chocolate disks and bittersweet chunks. I love the taste of blackstrap molasses, however in this recipe their was no hint of it. After weighing both the granulated sugar and the dark brown sugar; I thought WOW a lot of sugar for one recipe. I cut the granulated sugar from 104 grams to 52 grams. I did not change the salt weight, resulting in a bit of a saltier cookie than I like. In the future, I will follow the recipe. These are so yummy. So I broke out the Kerrygold butter - which has been on sale for holidays lately - for these double chocolate chunk cookies. I also had to swing by Bristol Farms to restock my supply of Ghirardelli cocoa powder because I found myself 23g short the night before when I mis'd all my ingredients. As usual I used metric measurements and a scale. The recipe is supposed to yield 12x 75g cookies...I ended with 11x 75g cookies in the end. *Someone* was eating cookie dough at every step of this recipe. :-) I have to say they are even better baked off with a big glass of whole milk! Even at 1:00am when I finished. I used a Standard oven, Guittard chocolate chips (I don't pay for chunks...and I haven't been doing chocolate work lately so had none to chop up), Kerrygold butter, and Ghirardelli cocoa powder. I used a metric scale and a standard oven. I am getting to be quite adept at using the scale, however I need to find a scale that will measure to tenth of a gram. The baking soda for this recipe was 2.3 grams I had to cheat this amount as my scale doesn't get that accurate. After only doing it twice, I find it much easier to strain and weigh the eggs. 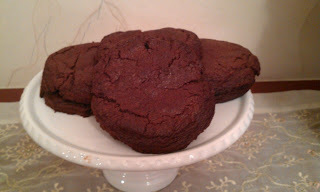 My cookies were so good, this recipe is a chocoholic dream! Chocolate, chocolate and even more chocolate. I was not able to find the suggested chocolate at the market so I used semi sweet and dark chocolate chips; I will make these again when I am able to source their recommendation. I weighed the cookies to 75 grams, baked them for 16 minutes and the recipe yielded 12 cookies. These cookies scream for a glass of milk for dunking and I know a certain bearded night visitor that would take time from his busy schedule to eat them! And this week, we have a new baker joining us! Welcome Leticia! This is my first bake out of the book as I just received it today. I baked the double chocolate chunk & chocolate chip cookies using the metric measurements and a convection oven. I creamed the butter using the torch to warm the mixer bowl. Truly amazing! I got nice peaks. This is my first success in baking chocolate chip cookies. They did not collapse! My search for the perfect recipe is over. Up next week, Thomas Keller's take on a classic, Better Nutters. Yum!